Mix everything in a bowl and slowly start adding water, mixing after each addition, until batter is thick but can easily drop from a spoon. In a frying pan, heat oil over medium heat and drop batter by the tablespoon. Allow to cook on each side at least 2 minutes, or until golden brown. Remove with slotted spoon and drain. 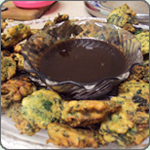 Serve with a sweet imli / tamarind or spicy green chilli chutney.